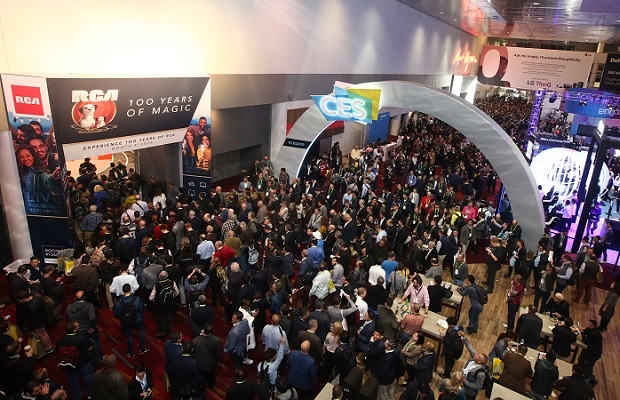 The US-China trade war took has an effect on this year’s CES with 20% fewer Chinese vendors are at the expo than last year. 5G was talked about everywhere, especially for self-driving infrastructure. An "in-video virtual ad service" called Tisplay lets YouTube stars and Twitch players insert digital ads onto their shirts. Tisplay recognizes the surface of the creator’s clothing and places the ads as if they were actually printed on the clothing through computer vision and graphics technology. Creators are able to place not only ads but also various images related to the video content in a way to communicate with viewers in real-time. Furthermore, viewers can enjoy videos without pausing due to mid-video pop-up ads which often feel like spam. The eDor is a door customised with expanding compartments to accommodate deliveries. The company claims it can be installed in the majority of door frames, and the expandable compartments on the door’s interior can be customised to each parcel owner’s needs. The delivery company is issued an eKey for each delivery, allowing them to open the compartment’s door using near field communication (NFC) technology, the same kind which allows you to make contactless payments. Once a parcel has been left inside one of the component, the home or business owner and sender receive an alert notifying them of its arrival. Procter & Gamble’s Opté skincare system detects and masks blemishes. It functions as a wand that scans the face and then precisely applies makeup. The Opté Precision Skincare System detects the colour and pigment of skin using a camera, detects blemishes and then covers them with the exact amount of makeup needed to seamlessly erase them. The system prints makeup on to the skin using tiny inkjet-like nozzles. Replacing an existing peephole, this is the easiest smart doorbell to install ever. And, since there’s no need for any drilling or screws, it’s ideal for renters or for use in apartments. The Ring Door View Cam has an impact sensor that can pick up when someone knocks rather than pushes the button on the front. This smart clock is a mini-Google Home Hub doubling as an alarm clock. The gadget combines a smart speaker with a hub for all your connected home tech. Not content with a Japanese-style heated seat and auto cleaning and drying systems, the US toilet maker Kohler has included Amazon’s Alexa too. The Numi 2.0 Intelligent Toilet promises a “fully immersive experience” with “dynamic and interactive multicoloured ambient and surround lighting”, built-in speakers and voice control. It costs $7,000 (or $9,000 if you want it in black). The Matrix PowerWatch 2 smartwatch never needs charging using your body heat to generate electricity. What if your smartwatch used you as a human battery so it never needs charging? That’s precisely what the Matrix PowerWatch 2 promises, sucking heat from the wearer’s skin to generate electricity, alongside a hidden solar panel for good measure. Move over Nespresso- how about a gadget that lets you brew your own beer without having to master the fermentation process. Like a Nespresso capsule machine, you load up the HomeBrew machine with your choice of beer – American IPA, English stout, Czech Pilsner, American Pale Ale or Belgian Witbier – then pick up your five litres of amber nectar after a two-week brewing process. It even cleans itself in preparation for your next batch. The Vive Pro Eye represents a big step change for VR, bringing eye tracking to the platform. Building on the already excellent Vive Pro headset, the Vive Pro Eye not only makes the experience more immersive and enjoyable, but more accessible, too. Specdrums are music-making rings that respond to colour, whether from the included mat or anywhere you find them in the real world. Tap the ring on a colour and it will turn it into a sound or pitch, which you can then mix together with other noises into a song. It’s easier than it sounds, and Specdrums will also soon have an app that teaches kids (or musically stunted adults) basic music theory. A Cinematic Snowglobes contains not just glittery snow, but a video clip which starts playing when it’s picked up and shaken. The idea is to customise the globe with a clip or photograph of your choice, which the makers say can be as long or as short as you like. If the globe remains still for more than 20 seconds, it will require reshaking to keep the clip playing. They are currently in production. Hyundai says its Elevate walking car could be the perfect go-anywhere emergency response vehicle. The Korean car company Hyundai has unveiled a car that can walk. The Elevate is capable of both “mammalian and reptilian walking gaits” using four articulated robotic legs that extend out from traditional wheel arches, but that can fold back down and drive like a regular car.. Experts are sceptical that Hyundai’s “limitless” design will actually work. But if it does, the car that “can climb a 5ft wall, step over a 5ft gap, walk over diverse terrain, and achieve a 15ft wide track width” will apparently be brilliant for emergency services and rescue vehicles.